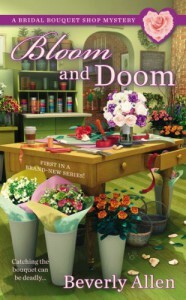 Bloom and Doom is the first in the Bridal Bouquet mystery series set in Virginia. The main character, Audrey, runs a flower shop with her cousin Liv. They do all kinds of flowers, but are known for the wedding flowers. Initially Audrey is helping a former friend Jenny pick out wedding flowers. Jenny and Audrey lost touch when Jenny lost quite a bit of weight and became friends with the health-club set. Jenny doesn't seem too excited about the wedding and later confides to Audrey that she plans to call it off. The day after calling off the wedding, Jenny's fiancé is found murdered and Jenny is the main suspect. Suddenly Audrey is the only one still on Jenny's side and is left to prove her innocence. The mystery is well thought out and plotted, although the mystery aspect seemed a bit light at times. We don't have many other suspects until later on in the book. While at one point I suspected the correct identity of the murder, I changed my mind and when the killer was revealed I was expecting it to be someone else. A secondary mystery was also woven into the story, regarding growing illegal drugs. I was completely wrong regarding the outcome of that mystery. A possible love interest is also introduced for Audrey in the form of cupcake baker Nick Maxwell. We will have to wait and see how that plays out in future books. Overall, this was a fun and enjoyable read and I look forward to further installments of the series. Disclosure: I received an ARC of the book which in no way impacted my review.